Speaking to Hürriyet daily, Zürcher said while the ruling Justice and Development Party, or AKP, exemplified the republican modernization process with the rural elite electing their own leaders to replace the republican elite, the party was not equipped to utilize the nation's resources to provide a boost to advancement. He said the victory of the AKP in 2002 over the increasingly powerless republican elite had given hope to the people but its paternal structure and hierarchy, not its conservative roots, precluded it from transforming the country into a modern state. The pace of progress in society was not matched by politics, said the historian, who is widely read in Turkey, adding that ultra-secularist and ultra-nationalist movements were not the solution either. “The Republican People's Party, or CHP, is not working for democracy. The AKP is not equipped to modernize the country. I don't know where you can turn. There is a huge gap in politics. There is a need for a liberal, urban, secularist political movement that does not try to gain legitimacy from either the military or religion,” said Zürcher. He said the AKP's policies seem a lot like the Justice Party, or AP, in the 1950s. 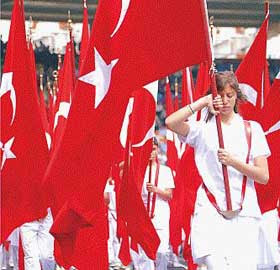 The AP was the first political party to win power from the CHP after the single-party era ended in 1946. Its first election success was in 1950, with an even bigger victory in 1954. “However, [Prime Minister] Adnan Menderes was spoiled and once the economy went down, he started to implement tyrannical policies and abused religion,” he said. The military toppled the AP in 1960 and Menderes was hung along with two of his ministers. He said it was hard for Turkey to become a country that respects the rights of women, homosexuals and minorities with an AKP government, arguing that the party had neither the mentality nor the necessary human resources for the task. “Liberalism is mandatory for modernization. A free market economy is not the only tenet of liberalism,” he said. I've written here quite extensively about the need for a viable leftist party, as well as about the demise of the Turkish left as a serious political force.